A new version of Gran Turismo 5 hits shelves January 17, bringing with it all the additions the game has seen in the past year. 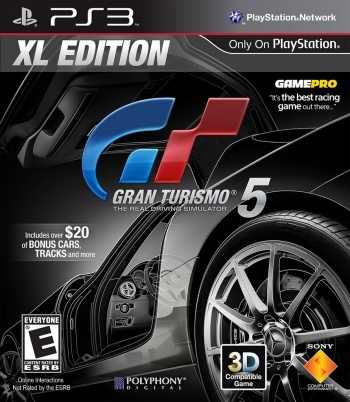 This morning, Associate Product Marketing Manager Brian Dunn took to Sony's PlayStation.Blog to officially unveil Gran Turismo 5 XL. Though the updated version of the game had been rumored for quite some time, no one involved would confirm the game, but Dunn's post not only made the thing official, it outlined what exactly the new title would include. All of that on a single PlayStation 3 Blu-Ray disc priced at $40. One key issue Dunn failed to address however, is what players might see when they first pop the disc into their console. When I first fired up the original Gran Turismo 5 I was asked to patiently wait for almost 45 minutes while the game installed nearly 8GB of data to my PS3's hard drive. Likewise, the more recent Spec 2.0 update took over an hour to download and install. While I like the idea of bundling all of this content together in a single disc, does that mean players are going to have time to watch half a season of Game of Thrones while waiting out the installation? Unfortunately I don't expect any word on this issue from Sony, so I guess we'll have to wait a week and a half to find out just how inconvenient the initial loading period is going to be. Worse comes to worst, it's a valid excuse for a mid-day nap. You've been looking tired lately anyway.